Home for the Holidays is a green, gold, and fuchsia multichrome flake polish with lots of gold holo glitter. It is slightly reminiscent of the fall polish called Autumn Palette (reviewed here), but Home for the Holidays has a lot more fuchsia and green (I found Autumn Palette had a lot more bronze and gold). You may be able to get away with 2 coats of polish if you have shorter nails, but I chose to use 3 because photographs tend to accentuate any tiny bald spots. Overall it had an impeccable formula. Mistletoe Kisses is an unconventional Christmas color because it's more of a minty green base than the common evergreen color. 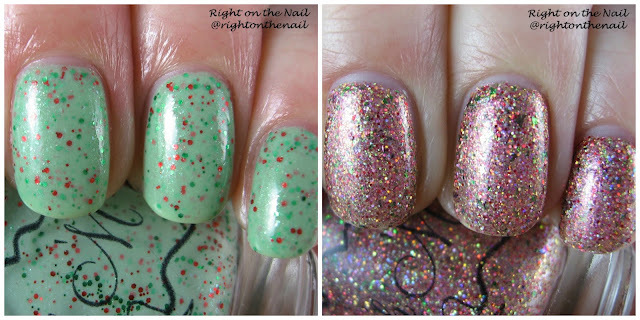 The mint base is complemented by lots of darker green and red glitter and green shimmer. I absolutely love this polish! I know many indie brands have stuck with holographic polishes this year, so I'm happy Michelle has stuck to her guns with releasing glitter crellies. This one was a bit sheerer than I expected, so I had to use 3 fairly thick coats for full coverage. The formula was perfect despite being slightly sheer.